One of the things I look forward to most in a day is a nice, long, hot shower. Nobody to bother me, nothing to worry about, just me, some soap, and 110 degree water pounding over me. I’ve given pretty much everything a try as far as bathing goes, and shower panels like these have so far given me the best experience. If you want to stick with me for a bit, I’m going to go over some great models I’ve looked at and tell you how I chose them for this list (and why I think any of them would be a great addition to your bathroom). The best around, if you can ignore its one drawback. Setting the bar for us is Vigo, with a simple and sleek design. While it doesn’t sport a fancy finish (nor do any of the models here by default), the stainless steel (with finish to match) provides a clean look that fits well into almost any bathroom décor and ensures a lasting shine (and lasting product in general). This one has a rainfall shower head (no waterfall, alas) with a handy little handheld shower head (the square ones like that have way more coverage than they look and are very easy to keep a hold of) for your basic showering needs, and the whole thing can handle up to 2 GPM of pressure (about average). The massage jets on this one are arranged so they’re more like extra rainfall shower heads (albeit turned to the side), and each of the two main sections is broken into three smaller ones (for a total of six massage jet sections), making it work better as a full coverage shower, but sacrificing a bit in the pressure department. Don’t buy this one if you want or need a high pressurized, targeted massage function (there’s enough of those later on the list). To round out the basic design, the stainless steel hoses (save the one for the hand shower, which is brass) are sturdy and unlikely to break unless you put undue strain on them. That said, the hoses neatly segue into the main drawback of this one: the hose connectors are visible from the top. I personally don’t see it as particularly noticeable, but it is a bit, so you may prefer to buy a cover for the top somewhere separately. For a few (especially given the near $500 price tag) this was a deal breaker, but everything else about the shower is excellent, so I personally didn’t see fit to bump it down from the top spot just for a slight aesthetic deficiency. Just keep it in mind if it really bothers you. Gives the Vigo a real run for its money. This was a tough call. It finally came down to bias: I like the massage (more like drench) jets of the Vigo better than the targeted massage jets, since it enhances the feeling of the main thing I like about showers (hot water hitting me all over), while I see massage jets as nice, but not must haves. On the other hand, this one has a much better handheld shower headportion (it’s a more traditional round, 4 setting shower head) and the wider rainfall shower head portion is nice as well. Really it came down to the massage jets, which are undeniably great for what they are: 8 jets, each individually controllable and adjustable as far as angle and such, and the whole thing sorted for even, maximum water pressure. It’s great at what it does, and I could easily see somebody swinging the other way on this one being the best option (ESPECIALLY given that it’s $200 cheaper than the Vigo). Still, each individual part is good, and most homes don’t have the volume or pressure in their water to run everything at once anyway. As long as the core bits work together I say it’s more than worth the asking price. This, I feel, is what most people think of when they hear about shower panels. This one’s main claim to fame is it does what most others don’t: allows for simultaneous use of all the shower nozzles at once (assuming you have the water pressure to handle it, of course). This makes it ideal for people who just want to be drenched from every angle, like a standing bath. It’s definitely appealing to ME if no one else, and I think would fit especially well in a shower closet (one a bit larger than usual so you don’t drown yourself, but one nonetheless). Everything else about this one is great too, as it boasts everything else we’re looking for. Eight adjustable jets, an acceptable (if not as great as the Ello &Allo) rainfall shower head, a better than average waterfall function, and a compact handheld shower head for rinsing. Basically, this one is for you if you want to feel like you’re caught in a very warm and comfortable rainstorm. I really like it, especially for the price (a bit cheaper than Blue Ocean’s model), and the black finish wins it a few brownie points over the utilitarian stainless steel looks we’ve viewed in the rest. This was another hard call, but ultimately it sits at #3 because the Blue Ocean has a better rainfall shower head and handheld shower head portions, making it overall better. Still this one is an EXELLENT model, and easily worth consideration (especially if the ability to fire on all cylinders is important to you). Ugly, bulky, but a great shower. Consider this one something of an enhanced version of a normal shower. That’s not a knock on this one at all, mind you, but it’s clear the centerpiece here is the rainfall shower head at the top (with a nice, long spout on it) and the attached waterfall bit, with the other shower panel accouterments there as added bonuses. Not that they’re bad, mind you, with my preferred “drench style” massage jets (and a few of the more adjustable ones too!) added on, and a serviceable (two setting, though kind of awkward) handheld shower head along for the ride. But really, the centerpiece is that rainfall shower head, which sacrifices the sleeker design of the above options for a more utilitarian look. What it lacks in artistry it makes up for in sheer coverage and great pressure for a rainfall shower head, a marrying of two of my favorite things in a shower. Best of all, it doesn’t charge you a whole ton extra for the other bits (it’s under $250; within the price range of a good rainfall shower head on its own), so if you like the base price and have the right shower to install this in (and can get past the blocky, tool-like design) it’s an excellent buy. I kind of feel bad for this Akdy. This low on the list you might expect me to say it’s a bad product, or at least less good than the others…but no, I’d say it holds its own for the most part. The main issue is it doesn’t stand out in any one respect (besides the price, about $20 lower than the Ello &Allo model above, making it our cheapest option). Where each of the other options has some big standout feature to go with its more standard other parts (the Vigo’s massage jets, the Blue Ocean’s different massage jets, the Perfetto’s simultaneous use, and the Ello &Allo’s great base shower head), this one stands as the textbook model. If you don’t know what you want to focus on: get this one. It has good to great specs on all its bits, and high quality construction (brass in some places, making it even sturdier than usual, if potentially more prone to corrosion if you fail to take care of it properly) for the price, making it a VERY safe buy compared to the comparatively super expensive Vigo (especially if you prefer these more focused spray jets, even if there are “only” 6 of them compared to the Blue Ocean’s 8). I don’t want it to sound like I’m knocking this one, truly: it has everything I listed as positives to look for on my list of criteria. It just doesn’t go above and beyond in one of the areas like the other four do (but neither is it deficient anywhere; consider it a jack of all trades model). It’s JUST a solid buy. This section is a bit different. With the exception of the Aston model, we’re going to be covering some of the top brands in more broad strokes, with a simple listing of their top product (covered above) and how it compares to their other products and their brand as a whole. Akdy is a brand that makes great products. Most of their other shower panels are of similar quality to this one. They have one clear product line, with increasing quality up to the top (though some, in my opinion, have less value for their price than some of the cheaper or more expensive models up and down the line), making them very simple to choose from. Generally speaking, if you look at Akdy’s top reviewed products, the most expensive one (which is only most expensive by a small margin, usually) is the best. There are a few pretty good units from different (seemingly smaller) product lines, but the 9000 series is the best performing and most cost effective by far, with the model above being the best of that line by my best estimate. Aston’s best is a bit of an odd one. It’s the second ugliest model here, but I won’t hold that against it too much. It has pretty much everything we look for (no waterfall attachment on the rainfall shower head, alas) and the nozzles are high performance. It even gets bonus points for being the only high GPM (2.5 Gallons per Minute as opposed to the standard 2 GPM) model here, since I do like my high pressure shower heads. Unfortunately, some pitfalls bring it down. From a design perspective the blocky design isn’t just ugly, it also makes the massage jets a little awkwardly placed compared to some others. That extra bit of spacing necessitates you turn them all inwards, making it a little less versatile as a massage tool. The biggest issue though is the availability, being ONLY available from third party sellers for wildly varying prices (up to as expensive as the Vigo, which this one is certainly not as good as). Since the manufacturer doesn’t list a direct sale price to compare it to, I’m not sure what the actual price is meant to be. If you can find it on the cheap (around $200 to $230) it’s worth a buy, but I certainly wouldn’t advise paying the current most common asking prices. Aston is a brand with a lot of potential, but their products are too hard to find on Amazon for a proper price to get a good gauge of their quality; even on their own website their specialty is shower doors, with a small selection of largely lackluster options to choose from. Give them a pass for now, until (or if) they become more readily available from a first party seller. Blue Ocean’s products are a severe mixed bag, with just as many good as bad products. Their main issue is that their products are either roughly similar to this version (very complex, feature heavy, and with only small variation sin function; this was the best of the bunch) or very stripped down and simplistic, essentially being glorified dual shower heads. This makes it easy to choose the best Blue ocean product, though not in a good way; most of their products are readily apparent as being overpriced, underfeatured, or both. I wouldn’t stray too far away from their top of the line; there is a steep quality drop off with many of this brand’s products. Vigo boasts a surprisingly small number of products, all of them uniquely named. The main issue with most of them isn’t that they aren’t good (most are), but most are just a little above what I think is the fair price point for all of them by a fair margin, especially given most of their shared problems: exposed piping (which many poorly review their products for, but I see as easily fixable) and poor quality control. The Sutherland escapes the latter, which is the primary reason it is on this list at all. I would be more than hesitant to recommend a product this expensive if it was known to have quality control issues, like the reported cracked hosing and loose fittings others have left reviews bemoaning, no matter the quality of its specs. Vigo is a brand with products that are quality on paper, but you should look carefully at what people are saying about before you buy one of. Four great products and one good (if a chore to actually buy for a fair price) one make up this list. There’s something for everyone here, especially in the top three, which I’m still torn on. I ultimately stand by my pick for the Vigo at the top slot for being the best combination of design, performance, and aesthetics but there are things about the Blue Ocean and ESPECIALLY the Ello&Allo that tempt me to buy them on those alone. All that said: it’s really up to taste. Even the Aston is great if you can find it for a fair price, and the Akdy is a perfect, safe “starter model” for you to buy, use for 6 months to a year, and upgrade if you figure out which functions you’re using the most and would like an upgrade on. They’re all good, solid buys! Take a look at other shower brands available! What Should I Look For In The Perfect One? You’d probably be surprised how easy it is to sum up what you should look for in a shower panel. The answer is: everything. Everything you would want in a shower head, you look for here. The only difference is instead of just choosing one type of shower head, or one of a number of functions, you want ALL of them. The main degree of difference between one shower panel and the next is how well it uses or provides all of these options, and whether the price it decides to charge is fair or not. Let’s break down the different sub-categories here though: shower heads, basic construction and materials, performance, and price. Your shower panel is going to have three different types of shower head: a traditional angled head OR a rainfall shower head (rarely both), a handheld shower head, and the massage spray heads. 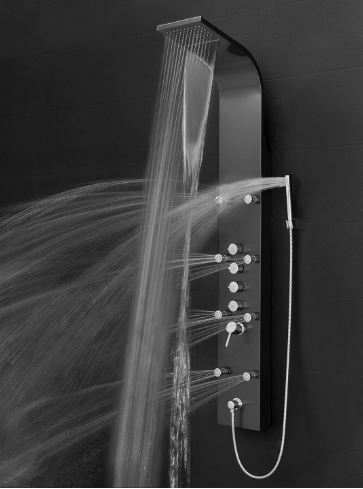 Most will also have a waterfall shower head, though that one is not as standard. Your traditional angled head is exactly what it sounds like: it’s the basic shower head you’re likely to find whenever you move into a new place. It should be easy to clean (as should all the nozzles), have multiple spray settings, and should be relatively high pressure (though by default not as high as the massage heads). A rainfall shower head, by contrast, is going to generally be lower flow and pressure, since they’re designed to fall straight down on your head and mimic the feeling of true rain falling down. The handheld shower head is likely to be a bit different than most you may have had before, since it will often (though not always) lack the multiple massage, jet, and other settings a handheld shower head may usually possess; those functions are taken over by different parts of the shower panel in this case. You’re basically just looking to see if it’s easily maneuverable and can get the job done more than if it can act as an extra massage head. The massage heads are both unique to the shower panel, and yet familiar. Instead of shunting the feature off to the primary or handheld shower head, a shower panel will have dedicated nozzles set to target different parts of your body simultaneously during your shower. Better models usually have more massage heads, and the average is between three and six of them set at even intervals. The waterfall showerhead usually comes as a separate “setting” for your rainfall shower head: a wider hole at the top that emits a full sheet of water that cascades down. Excellent for rinsing hair, or if you just like having a high volume of water dropped on your head. Not anything particular to discuss here; one waterfall shower head is much like another. Even more than a regular shower head, you want high quality materials and a clean look. It can sometimes be hard to notice a dingy shower head since it’s meant to be small and unobtrusive, but shower panels are large and in your face. You want them to be easy to clean and good looking on their own. Your basic materials are going to be stainless steel with a chrome finish, but other finish colors are usually available if you look. Bonus points if it hides the connections perfectly; while some quite good models do not (leaving the connections visible above the panel), it’s always preferable for them to be out of sight and out of mind. As simple as it sounds: just like any other shower head, you want a good water pressure for the flow your home can provide, and no pesky clogs or other issues that mar your relaxing shower experience. Discounting any installation costs, shower panels are surprisingly affordable, occupying a price range of somewhere between $200 and $500 on average. There are single (higher end, mind you) shower heads that can cost that much, so the sticker shock should be pretty low for this list.